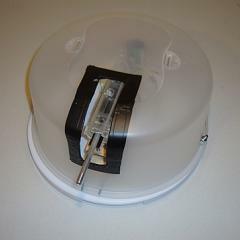 Today’s PyroElectro Project: The Tupperware Turret is a highly modified airsoft pistol put onto a pan and tilt platform with a turret cover. It rotates, tilts up and down and has precise fire control. Control is done wirelessly with a generic TV remote control. Great, fun shot—with one glaring exception: The Receiver location. Who wants to have to run around to behind the turret to control it? YOUKNOWHUTIMEAN, VERNette? Haha, Ideally you will be located directly behind the turret when using it so that wouldn’t be a problem. I don’t know too many people who like getting shot at =P.